Want to win the experience of a lifetime to help celebrate our 100th match in the Hyundai A-League on Friday night? Want to win the experience of a lifetime to help celebrate Melbourne Heart FC's 100th match in the Hyundai A-League on Friday night? 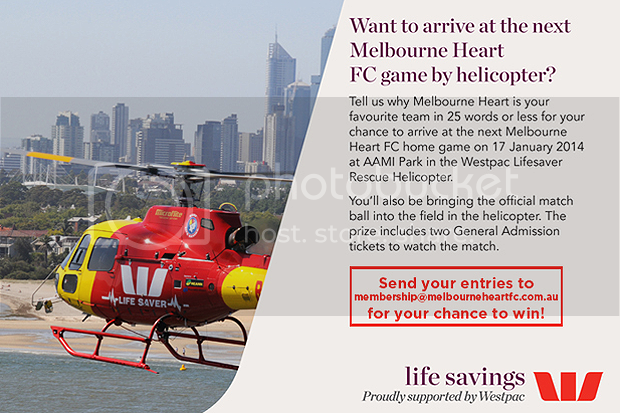 Westpac is giving members the amazing opportunity to travel to Friday's match against the Newcastle Jets in the Westpac Lifesaver Rescue Helicopter with other Melbourne Heart representatives and bring the match ball into AAMI Park! All you need to do is tell us why Melbourne Heart is your favourite team in 25 words or less! Send your entries to membership@melbourneheartfc.com.au for your chance to win! The competition is open to 2013-14 members, so make sure you sign up before you enter. Good luck! Melbourne Heart FC and Westpac Westpac has a proud history of firsts: Australia's first bank and the country's first company; we opened our first branch in Victoria in 1851 and 158 years later we became Melbourne Heart's first principal sponsor. And just like the Heart, we believe in being at the heart of our communities. Our people live here, work here, play here and as a result we are committed to forging strong partnerships with those individuals, organisations and communities whose values reflect our own and who are dedicated to building better future for all Australians. Melbourne Heart is proud to have Westpac as its principal sponsor, a partnership that stems from the club's creation in 2009 and which will span 100 games together with the momentous match on January 17 against the Newcastle Jets. To commemorate this special occasion, the Heart and Westpac ask you to help to support another great community service, the Westpac Rescue Helicopter Service, through our "100 for 100" campaign. Westpac Victoria has so far raised $75,000 for the Victorian 'choppers and we want to make it $100,000. Help us reach our goal of "100 for 100" at our 100th game. Show some heart and donate on the day or at any Westpac Branch.